The Corley Gasket Company is a manufacturer of custom-made gaskets to SPEC for government and private industry. 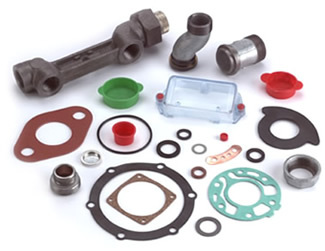 Automotive accessory, wheel hubs, single engine aircraft and speaker industries are just a few of the areas in which Corley Gasket Company excels. We are continuously searching for other industries in which we can expand our business, so send us your prints or samples for bids. We offer all types and styles of gasket materials in roll or sheet form as well as for fabricating. We carry vegetable fiber, Neoprene, Buna-N, Viton™, Silicone, Butyl, Sponge Rubber, Teflon®, Felt, Plastics, Red Rubber, and Cork. Corley Gasket Company carries all sizes of O-Rings in metric and commercial standards in a variety of compounds (Nitrile, Neoprene, Silicone, Viton™), O-Ring kits and O-Ring cords. We carry all types, sizes and styles of protective caps and plugs - plastic & metal, conductive and anti-static, vinyl, plastic webbing and plastic edge liners.